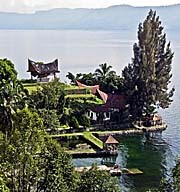 For a 'Map of Lake Toba' click the link or the image. 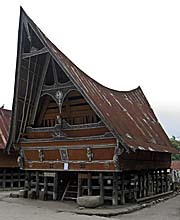 A traditional Batak Toba house at the 'stone chairs' in Ambarita, Samosir Island. 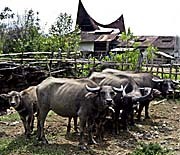 A Batak Toba village. They are surrounded by a wall on which bamboo or other trees or bushes are planted on top. 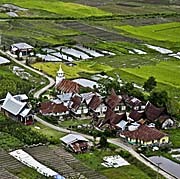 Many of these traditionally villages are on Samosir Island and around the lake. They look as same as they do on old pictures, made 100 years ago. But, nowadays, many of them have electricity and TV. Many, but far not all. Batak Toba hamlet, seen from the slope of Pusukbukit Mountain. The eruption of a volcano. Smoke and ashes reach the higher regions of the atmosphere. 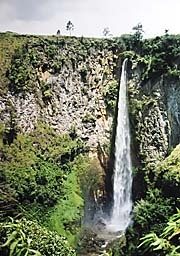 Sipisopiso Waterfall at the northern point of Lake Toba near Tongging. Sipisopiso is an 80 meters high fall and the tallest in Indonesia. There is no pond on top of the canyon. The images are all by Asienreisender, 1995, the photocomposition in the middle consists of two photos and is made in 2014. The bottom picture shows part of an Indonesian postcard, also from 1995. Between Pusukbukit Mountain and the mountain chain west of it there is a small valley with a small Batak village and rice paddies, arranged together with a sophisticated irrigation system. On top of the mountains there is a high plain which is overgrown with rainforest. 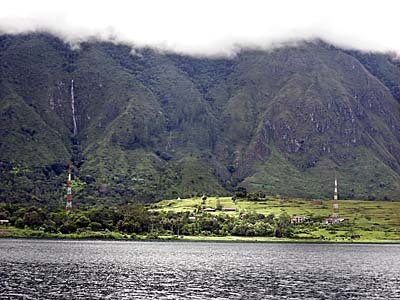 The barely populated mountainous area between Lake Toba and the Indian Ocean is a refuge for wildlife. 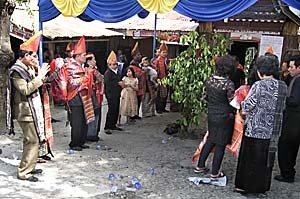 The two audios were recorded on Batak weddings, where traditional Batak music was played. For a large, interactive 'Map of Sumatra' click the link. 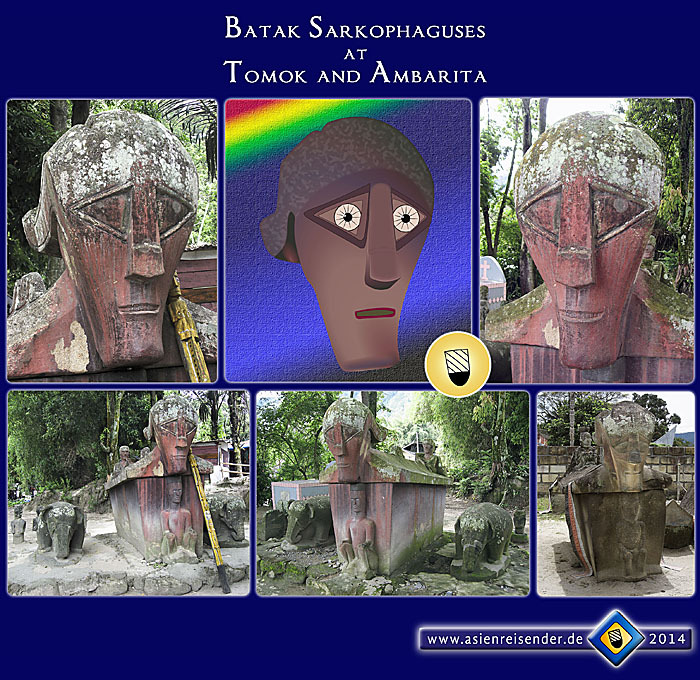 The image bottom left shows a Batak totem pole at the stone chairs 'Huta Siallagan' in Ambarita. Travelling a lot means to see many different landscapes. Hills, mountain sceneries, rivers, lakes, sea shores, plains, towns, cities, agricultural dominated countrysides. They all are individual. But sometimes one sees really extraordinary landscapes, really phantastic. They are rare. One of them is Lake Toba and it's surroundings. Descriptions, photos and movies are too weak to give a real impression of how magnificent it is. Lake Toba is a natural treasure in Southeast Asia. It is shaped by an earth-historical outbreak of a supervolcano who erupted here some 74,000 years ago. Lake Toba is the largest lake in Indonesia and the largest volcanic lake in the world. 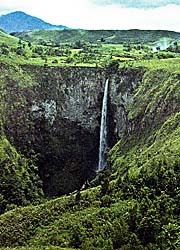 Sipisopiso waterfall at the northern end of the lake is, with a height of 80m, the tallest waterfall in Indonesia. But it's not only the landscapes which makes the area so special. The here living Batak People are also a unique tribe with a still widely alive, vivid and interesting culture and history. 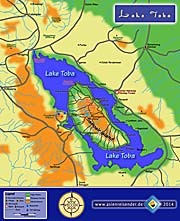 Map of Lake Toba and a small part of the surrounding Barisan mountain chain. The Barisan mountains cross whole Sumatra from north to south. For a large version of the 'Map of Lake Toba' click the link. 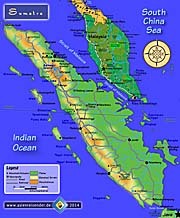 For a large, 'Interactive Map of Sumatra' click this link. Across the length axis of Sumatra the Barisan Mountains are a huge mountain chain of volcanic origin. 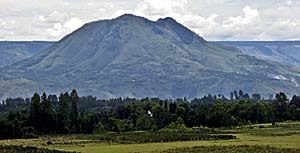 In the north of Sumatra, as a part of the chain, was historic Mount Toba. Here the mountains erected under the pressure of tectonic plates pushing from the southwest to the northeast, forming this huge mountain and containing a huge gas bubble in the underground. About 74.000 years ago the whole area erupted in an huge volcanic outbreak. Mount Toba became a super volcano. Scientists claim that it was the biggest volcanic eruption in the last two million years and one of the biggest in earth's history. Part of the area collapsed after the outbreak and formed the grand lake and the surrounding mountains. 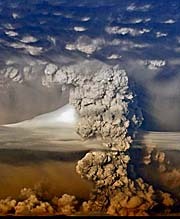 The eruption blasted so much ashes in the atmosphere that it caused an average layer of 15cm over whole South Asia. Parts of Malaysia were covered with a 9 meters high layer of ashes. In a certain place in central India there is still a 6 meter layer of remaining ashes of that outbreak. Hot Springs near Pangururan, at the foot of Pusukbukit Mountain. A great spa for relaxation. Very seldom there are any people in it. According to antrophologists that volcanic outbreak caused a huge climate change (volcanic winter). Global temperatures dropped down to between 3 to 17 degree centigrade for some decades. Due to that homo sapiens almost extinct from earth. Maximal 15.000 individuals remained, maybe only 5.000. Mankind passed a 'genetic bottleneck', as scientists call it. At that time all members of the homo sapiens species were still living in Africa. That by the way shows, that we all have common ancestors. Homo neandertaliensis, another human species, survived more successful. They were better adapted to cold climates. Neandertaliensis died out at the end of the last ice age, just some 10.000 to 12.000 years ago. They lived in Europe long before the first of our kind entered the 'old' continent. There are still many volcanos around Lake Toba, some of them active, some of them are extinct. There are also hot springs around (e.g. the hot springs near Pangururan), what shows how thin the firm earth crust here is. Below it is hot volcanic magma. Lake Toba is situated 905 m above sea level. That makes, although being very close to the equator, a very nice climate. It's not too hot, it's not too cold. It's actually an ideal climate. Well, there is much rain, especially in rainy season from November on it pours every day masses of water from the sky. I have never seen anywhere stronger rainfalls than on Sumatra (especially in Bukit Lawang, not far north of Lake Toba). That's why it is so green everywhere around. When the sun shines, the colours are bright, vivid and beautiful, much green and much blue, deep colours, typical for the mountains, and here enriched with the colourfulness of the tropes. Lake Toba is the biggest vulcanic lake on earth, with the double size of the Bodensee between Germany, Austria and Switzerland in the Alps. In middle of the lake is an island. Samosir Island. It has about the size of Singapore. On Samosir Island are few settlements of significance. On the western side of the island lies Pangururan, a shabby local village without any tourism. On the easter side is Tuktuk situated, a village on a kind of a mushroom shaped peninsula, where are all the guesthouses and a simple tourist infrastructure is situated. Opposite to Tuktuk is Parapat, on the main land side, from where a bus connection leads to Medan, another one further down to the south of Sumatra. Ferries are commuting to and fro between Parapat and Samosir Island. On the eastern side Samosir Island is lifting up steeply behind a narrow, coastal plain corridor. Mountains of a height of some 500 meters and more erect (measured from the lake level. In total they reach a height of around 1,500 to 1,600 meters). At the easter side of Samosir Island here are very few pathes leading up to the top of the island (three?). From there one has a great view over the lake and the opposite side of the lake, which is some eight kilometers wide (e.g. the distance between Tuktuk and Parapat). The depth of the lake is according to the height of the mountains. The deepest part in the lake is 505 m.
To the western side the altitude is lowering down smoothly to lake level. For hikers it's a very nice, some 40 km walk from Tuktuk to Pangururan. At Pangururan, Samosir Island is separated from the main land only by an artificial canal which was build by the Dutch in the colonial time. The canal makes the waterway passable around Samosir, and it makes Samosir an island. 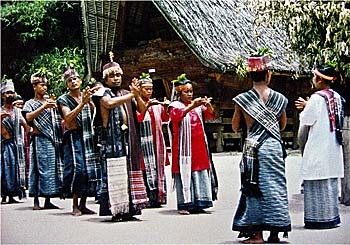 Traditional Batak dance at Hutabolon museum on Samosir Island. Indonesias population consists of some 400 different ethnics or tribes. At and around Lake Toba are six Batak tribes living. Samosir Island and the area south of the lake is dominated by 'Batak Toba People', whereas north of the lake 'Batak Karo People' live (Karo Batak Highlands around Berastagi and Kabanjahe. The Pakpak (Dairi) Batak live northwest of the lake. 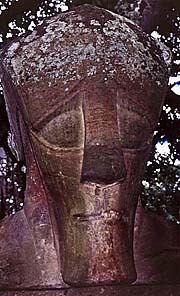 There are different theories current about the Batak Peoples origins. Anyway, they live here since a long, long time already, and did so over most of their history in a very isolation. Marco Polo, when bypassing Sumatra in 1292 CE on a boat on the way back to Europe, reported about maneating mountain people which he called 'Batta'. The first Europeans, missionaries from Britain, encountered the Bataks in 1824. The first reliable maps of the southern Batak territories were made by Franz Wilhelm Junghuhn in 1842. They were for a long time the only available maps of the region. 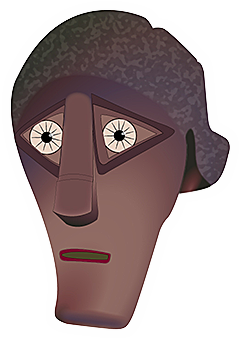 Nevertheless, Junghuhn didn't reach Lake Toba in his expedition, for the locals were too hostile and the natural obstacles immense. The Dutch colonial authorities weren't very interested in the Barisan Mountains and the there living people. They expanded their control over the land relatively late in the years around 1900. The 'Batak Wars' ended finally in 1907. The traditional Batak culture was a martial one, with fightings among the different clans and villages, with headhunting and ritual cannibalism. The animistic Batak religion included practices of ritual halucinogene mushroom eating. 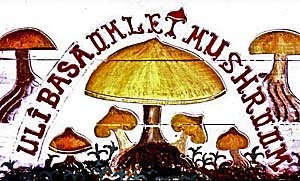 That's why some of the restaurants nowadays offer 'magic mushroom' dishes for tourists. It's part of the touristic commercialization of the local culture. The social structure is organized as a complicated clan society. For an outsider it's not easy to understand the 'who is who' in the Batak society. However, anybody has a certain status. Very remarkable is the fact that the Bataks are very musicious people. Everywhere are local people playing the guitar and are singing local songs. Apparently it makes them a lot of fun. There is also a modern kind of Batak rock music, played by professional local rock groups and commercialized and distributed on CD, DVD and so on. There is a saying among the Bataks: If there are two Bataks together, they play chess; if there are three Bataks together, they play cards; if there are four or more Bataks together, they play music. Batak Toba children, comming from school. 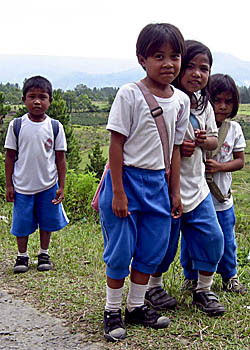 Inland Samosir is so remote that many people rarely have seen a foreigner before, especially the children. Among the children the sight of a foreigner causes frequently anxiety. 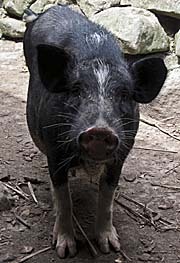 Sometimes they run away or avoid to meet one on the road or path, rather making a big detour through the bushes or over the fields. That might have to do also with their own, martial past, when the villages were raided by invaders. Also remarkable is the passion of the Bataks for chess. Very appreciated the times I could play some games with the locals. They have an own playing style what is far away from everything I once learned about theory in literature and chess clubs. It's also remarkable that many locals here read a local or national newspaper. That's really not everywhere the case in Southeast Asia or Indonesia alone. Because the Dutch colonialists weren't very interested in the mountainous regions around the lake, the Batak could maintain much of their traditional life. 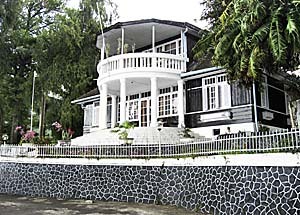 On Samosir Island e.g. the original animistic religions were still practiced until the mid 20th century. In the 1950's the Indonesian government forced the local people to join one of the major organized and officially accepted religions. Not being a member of one of these limited numbers of churches (Islam, Protestantism, Catholicism, Buddhism, Hinduism, Confucianism) is considered a crime under the Indonesian constitution [!]. Two young Bataks are making music with a group of village kids in a chapel on Samosir Island. Since there was much christian missionary activity since the 19th century (a local 'celebrity' is the German missionary Ludwig Ingwer Nommensen from the 'Rheinische Missionsgesellschaft', who was active here in the years after 1860 CE), most of the Batak People joined christian churches, becoming protestants or catholics. In 1917 the Batak founded their own christian church, the 'Huria Kristen Batak Protestan' (the 'HKBP'. By the way: there are some 2,000 different christian sects existing worldwide). For Westerners it's amazing how important the people here take their religion. However, under the surface of the ordered monotheism the old traditions are still alive and being practiced. Especially in the Batak Karo highlands many people are still animists and follow their very old traditions and occult religious schemes. There are even rumours that in very remote areas still cannibalism is practiced. The population of Samosir Island is apparently very homogenous. There are almost no muslims living here. In Parapat, east of the lake on the main land, there is an islamic parish. Most interestingly it is to see that the Batak People at Lake Toba and around have still a very strong connection to their old, traditionall tribal culture. Organized as a clan society, public decisions were traditionally made in the 'adat', what is a congregation of all the adults of a tribe, village or clan. 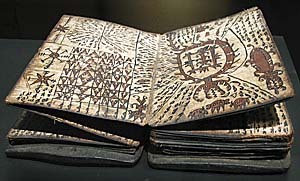 A Batak book of magic, used by the wizards of the Batak Toba tribe. The item is now to see in the 'State Museum of Ethnology', Leiden, The Netherlands. 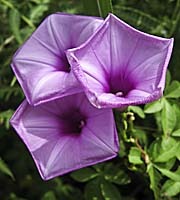 Image from de.wikipedia.org, common free. Whenever one talks to a Batak person about the Batak People as such, it soon turns out that he or she is very well informed about the orally transmitted history and culture of the tribe and the connections to the other tribes. Although the tribal's myths, legends, customs and history are transmitted mostly orally, the Bataks have their own alphabets and there exist some books in Batak language. Altogether there are six Batak tribes living in the wider surroundings of Lake Toba; they all speak their particular language, who can be categorized into three main languages. The Toba-Batak, the Mandailing and the Angkola Batak's languages are close enough by each other that they are understood by the other tribes. However, all the six tribes have their own alphabets; they are derived from one of the many ancient Indian scripts and came to Sumatra over Java. As mountain tribes generally, the Bataks are much more conservative than people in the lowlands. The Bataks burial ceremonies are quite sophisticated. Particularly the chieftains get very representative and long-lasting burial sites. Unfortunately, as it is so often the case in Southeast Asia, it's difficult to get reliable information about details, particularly dates. I roughly estimate that the burial site of the Sidabutar clan at Tomok dates back to the early 20th century. 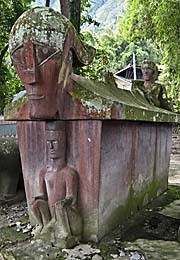 When moving around on Samosir Island (hiking is best, because it leads to the most hidden places), one finds impressing and representative graves at many places. Not few are of a younger age, but no more made perfectly in the traditional style, when the sarcophaghi where carved from stone or hardwood. The modern ones are made of brick or concrete; however, the surface is still widely decorated in the traditional style. 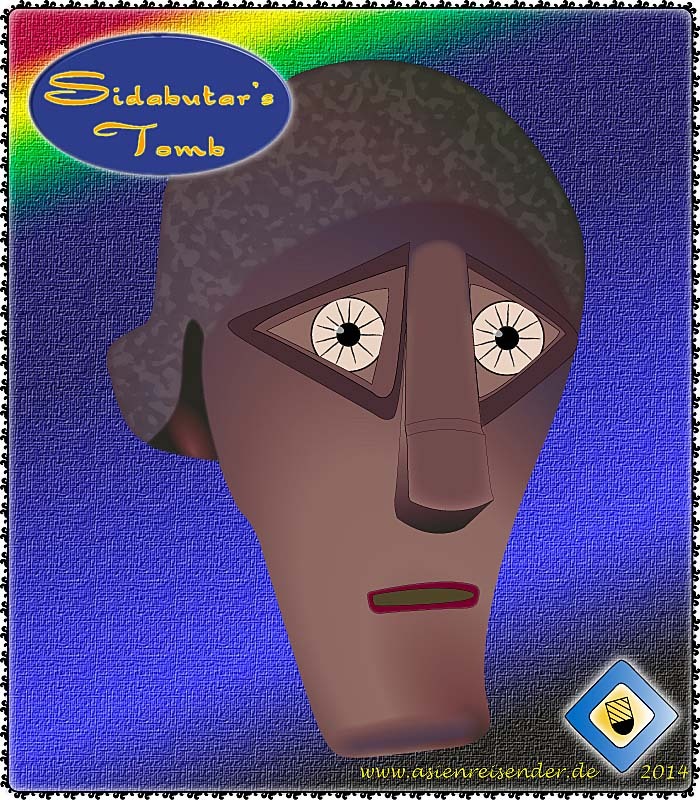 The first five images show Sidabutar's tomb at Tomok. The last one is a similar place at Ambarita (the site of the 'stone chairs', 'Huta Siallagan', a former Batak court place). 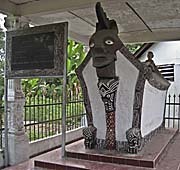 These two places are, by the way, the two most popular and touristic burial sites in the Batak lands. The five photo images were done in 2009, the sketch and the photocomposition in 2014, all by Asienreisender. Excessive logging, burning of forests and hunting precious species caused a lot of damage for the nature in the 20th century until today, especially from the 1950s on. Protective laws are more or less meaningless due to the omnipresent corruption in Indonesia. The animal life and all the plants here in the region are underoing changes since most of the 20th century already. Especially the lake was target for species from other world regions, including invasive species. The Dutch colonialists set out alien fish species for the purpose of fishing. These fish were more nutritious than the original kinds of fish in the lake, or just suited the Europeans taste better. A couple of decades ago tilapia was invited to Lake Toba. Tilapia is an African fish well known for being a nutritious diet, especially containing valuable proteins and fat acids. There are almost 100 different kinds of tilapia in the world. 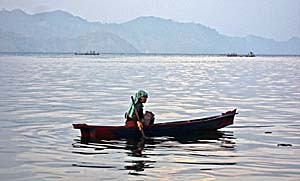 Here in Lake Toba are now some of them living. They are an important part of local fishing activity and are also bred in little fish ponds. In Lake Toba are also masses of the little, charming 'guppies' living. They are present in great parts of Southeast Asia; usually they are populating the rice paddies, lakes, ponds and even flower pots. They eat mosquito larvaes and are insofar part of a pest control. Originally the guppies are coming from Central America and are also an 'imported' species. 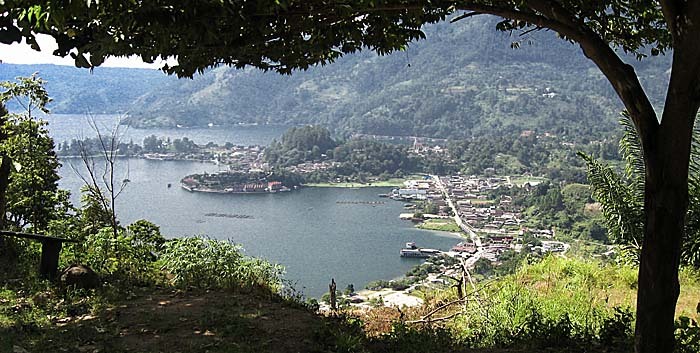 Generally, Lake Toba is not rich in nutrients. That makes the biotope housing less animals than there are living in other tropical lakes. 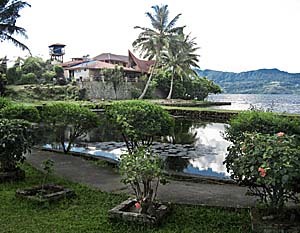 The surroundings of the lake are partially still coined by tropical rainforest, partially by Sumatran pine-tree forests. These pine-forests, together with the moderate climate, gives the area a touch of a northern surrounding. By the way, pine forests are home for less animals than there are in the tropical rainforests living. The infrastructural development in the mountainous and economically rather unimportant part of Sumatra is not very advanced. 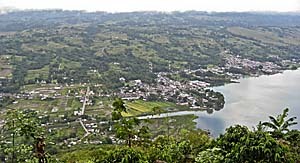 The bigger places at the lake are Parapat at the easter shores of the mainland and Pangururan at the western side of Samosir Island. The touristic centers are particularly Tuktuk, less Tomok and Ambarita and some other places like Huta Bolon and the hot springs at the foot of Pusukbukit Mountain. These places have road access and electricity. Other places, apart from the roads, still lack electification. The water is coming either from the lake, from a small river or spring, or it's collected rain water. The hotels and guesthouses use water pumps to get the water in their water towers. The pumps can be very noisy and therefore extremely unnerving. Waste water is flushed back into the nature, mostly into the lake. The shores of Lake Toba slightly south of Tomok. Two mobile phone towers support telephony, but internet is still on a very low level. It's generally difficult to get computers in Indonesia, and to use it is difficult for the uneducated. Promotion of the internet is coming together with the distribution of idiotic consumer crap like popmusic, ringtones, dull games etc. Notice the waterfall in the picture. It's possible to climb up a slippery jungle path to reach a basin at the food of the fall and to have a bath there. The roads are generally narrow and there are few. On them is not much traffic, for the Lake Toba area is not densly populated. The road from Tomok up to the mountainous 'top' of Samosir Island has been built or at least improved by the logging industries in the early 1990s. They used it for their lorries who went up and down there all the time and brought big trunks to the paper mill on the mainland. It's supposed that they also brought the expansion of electricity with them up to the mountain. On the island there is mostly the ringroad to mention, and a very few small, sealed roads in the inner island, but most of them are dirt roads or simple tracks. The ringroad around Samosir Island is better in the northern part than the southern. The road from Medan via Pematang Siantar, Prapat and Balige leads further south to Bukittinggi and Padang. It's part of the 'Transsumatra Highway'. Fortunately there is little traffic on the few sealed roads, and that makes much of the life-quality of the place: the relative absence of these stinking, dirty, noisy tin cans who are pesting our present world so much. Those vehicles who are on the roads are therefore not simply an annoyance as usually, but really dangerous: Indonesian's drive generally fast, aggressive and lack the basic driving skills. One has to be very carefull, more than normally. In 2008/2009 a kid, a young schoolboy, fell off the roof of a schoolbus. The busses are every day crammed full with pupils and who cames late and does not find a place inside the vehicle takes seat on the bus' roof. However, this boy died. Apparently the deadly incident didn't cause any consequences. The relatives may pray to their god(s), and that's it. The poor transport wasn't improved in the following time. There are some ferries running from Parapat to Tuktuk and Tomok. The passenger ferries to Tuktuk go every hour from 7 a.m. on until four or five p.m. If there are not enough passengers, they won't go and wait for more, what can delay one pretty much. The ferry between Parapat and Tomok is a car ferry, which is big enough for trucks and (tourist) busses. I think it was first established in the 1990s for the logging industries. There are also ferries from Nainggolan and Onan Runggu across the lake direction to Balige. That's all of the roads on Samosir Island, and most of the other roads on the mainland aren't bigger, except the 'Transsumatra Highway', what is a little bit wider, but not much. The image left shows the road between Tomok and Silimalombu. It's roughly paved, but there are potholes and parts of the road are broken. Now, in dry season, it looks pretty nice, but in rainy season the road is at some parts overflooded. Minibusses are rare, traffic is little, and the lady on the picture carries her shopping in a bucket on her head. A smart, traditional solution, which requires certain skills. The road on the photo right side is the biggest on Samosir Island, here between Tuktuk and Ambarita. The kids give a spontaneous fun show for the photographer, only to hold the hands open after the photo-click-click to demand money. Both images are made in 2009, the photocomposition in 2014. All by Asienreisender. So, since there is not even electricity everywhere in the Lake Toba region, there are not many internet connections. Apart from a few guesthouses and hotels in the touristic infrastructure there is practically no access. Although it would be technically easy to establish. I tried to get a connection with a SIM-card and a USB-modem; however, it was the worst internet connection I ever had. Although connected, data transfer was always so slow that it was almost futile. The salesmen in the shops have practically no idea about the technology they sell and are of no help at all. However, technical progress is quickly going on also at Lake Toba and there will be improvement. Mobile phone connections are therefore, as everywhere, established. In some regions there is certainly no reception, but in the towns there is everywhere access to the telephone net. There is only one tourist center at the lake. It's on Tuktuk peninsula, Samosir Island, where a lot of guesthouses and restaurants are located over kilometers along the lake's shores. There was an emerging tourism from the 1970s on. More and more Westerners came to Sumatra, entering Asia mostly via Bangkok airport and travelling southwards through the south of Thailand, Malaysia and then comming over from Georgetown on Penang to Medan on Sumatra, using the ferry for transport. There were only few places Western tourists went to; that was Bukit Lawang, a jungle village some four, five hours away from Medan, amidst a fabulous nature and an orangutan station, where orangutans were trained to live independently in the jungles of the Gunung Leuser National Park again. Then there was Berastagi in the Batak Karo mountains, a phantastic climatic spa with healthy air and two big volcanos around. A great scenery for hiking. 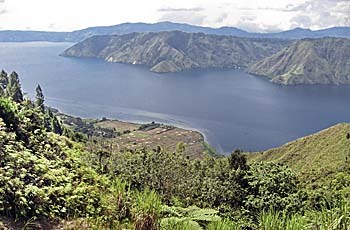 And Lake Toba, on the route further southwards to Bukkittingi and Lake Maninjau. The touristic peak was reached in the mid 1990s and broke down in the Asia crisis in 1997, the political unrest in Indonesia and the desastrous forest fires on Sumatra in the same year and 1998. Indonesia changed from a ruthless dictatorship to a totally chaotic and not less than before corrupt democracy. First the tourists were shocked by potential dangers, later the laws changed and it's much, much more difficult and quite expensive now to get a visa for Indonesia. The tourist stream changed. It changed to the north, now rather leading from Bangkok to the north of Thailand, Laos, Cambodia and Vietnam. Since June 2010 there is not even anymore the ferry service between Penang and Medan running. One must use a plane since then to reach Medan. The tourist infrastructure is still maintained in Tuktuk. But, when in the mid 90s all the restaurants and pubs were filled with guests, music all around, people on the road... - it's quiet now. The restaurants are still open, but there is barely somebody sitting in one of them. It's all empty now. Only on weekends and on national holidays groups of local tourists, mostly from Medan, arrive. Some others come from busy Malaysia and Singapore. But that's no substitution for the former booming tourist industry. Local tourist business is no more running well. The mushroom-shaped peninsula on the left picture shows Tuktuk, what is the place with the most developed touristic infrastructure and an arriving point when coming on the ferry from Parapat. Guesthouses, some hotels and plenty of restaurants are there, but the tourist part of the village looks mostly like a ghost town. The local people make their income nowadays mostly with conventional businesses in the agricultural sector, a few in the service sector and some still with tourists, but it's no more enough for all of them. When walking from Tuktuk to neighbouring Ambarita (about an hour walking) there is a very hidden jungle path leading up the steep slopes. It's pretty difficult to find, because not many people are using the small track, and it's partially overgrown. It leads up to the top of the mountain, about 500m to 600m above Ambarita. The climb takes some 90 minutes. After the top is reached, the path get's a bit better and leads into a dense forest (a plantation with large trees). Reaching the first bigger dirt road made by the loggers in the 1990s, one turns left and next dirt road right again. It's another hour to Jenny's Guesthouse (right photo). I know Jenny's Guesthouse since 20 years and I have never seen other guests there. It's a very basic, but cosy place where one can spent a night and continue next day to Pangururan. Romlan Guesthouse in Tuktuk is a real recommendation to stay. The rooms are fine, not small and clean, and the kitchen is one of the best, if not the best in the place. That's, so to say, a 'classic' hike on Samosir Island. One can do the hike of course in one day, starting in the early morning. From Tuktuk to Pangururan it's between 40 and 50 kilometers. One can catch a 'becak' there (a mini bus) an go back the same day to Tuktuk, provided one arrives in Pangururan before 5 p.m., when the last bus goes. Personally I walked on Samosir Island up to 60km per day. It's, by the way, easy to get lost there and advisable to have a compass. The tracks are zickzacking and sometimes serpentines inmiddle of large forests, what makes one loosing orientation. When getting lost and the evening is approaching, it's better to ask trustworthy looking locals for a place to sleep. One can spent a night then in a peasant's house, either on the floor on a very thin mat or in a wooden bed without mattress and a kind of a potatoe sack instead of a blanket. But, still better than spending the night outside. Up there in some 1,500m above sea level, despite being close to the equator, it can be pretty chilly at night. If it starts to rain (not seldem it pours heavily) a roof above the head is of great value. I hiked many times all over Samosir Island and it was among the best I experienced in Southeast Asia. The hikes are particularly great because of the lack of paved roads and, more than that, the absense of ugly cars and motorbikes. Apart from a few exceptions. Image left 2009, image right 2010 and photocomposition in 2014. All by Asienreisender. In the 1990s logging companies built roads up from Tomok to the top of Samosir Island and further into the deep forests. They cut down all the native rainforest there to feed the paper factories. 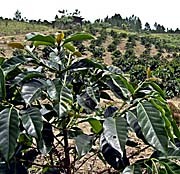 Afterwards the area seems partially reforested with pine trees, eucalyptus and different plantations, among them coffee. Big parts of the area grows up again uncontrolled as secondary jungle. The logging was a big disaster for the ecology and changed it irreversible. Left are now the abandoned and unpaved roads of the lumberjacks. In general it seems that a lot of the species around here originally didn't belong to this world region. Many plants were brought from South America, Africa or elsewhere and spread out uncontrolled. Much farming of foreign plants happens as well. There is coffee cultivated, eucalyptus, tapioca, rubber trees and many others. 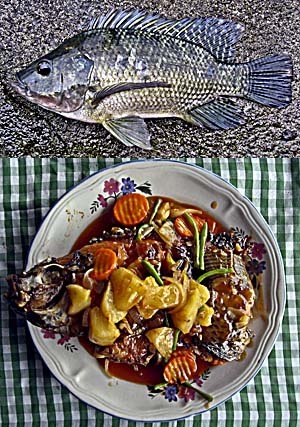 Tilapia is a foreign species from Africa (Lake Victoria), introduced to Lake Toba. It is a big fish species and excellent for food. Tilapia has low levels of saturated fat acids, low calories and, due to their short live span, they accelerate low amounts of mercury. Further on they are a good source of phosphorus, niacin, selenium, vitamin B12 and potassium. For they are fast growing, they are very profitable for industries and can be processed into skin- and boneless fillets for export. The original, genetically pure kinds of tilapia are as good as extinct due to industrial exploitation. Nowadays, wild tilapia are decendents of escaped farm fish, all are hybrids of different species. Tilapia is concidered being a highly invasive species, threatening other species. In Lake Toba are since 2002 industrial fish farms run by a Swiss company producing tilapia for export. Due to the use of fish food in great masses (partially rotting on the ground), antibiotics and a big amount of dead fish (also rotting in the lake) the water quality of the lake changed much to the worse. The fish farms have a big, negative impact on Lake Toba's water quality and, moreover, they are expected to expand. Other fish species from other countries were also introduced. The lake's fauna has been changed over the whole 20th century again and again. Also the flora is suffering the introduction of species who have no local enemies, making them invasive species and supplanting local species. 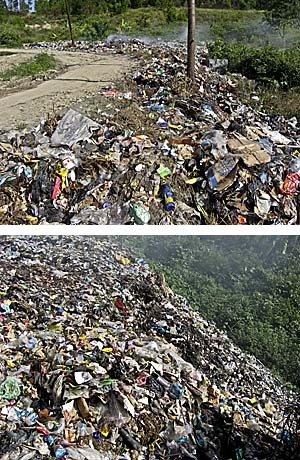 An official waste disposal site near Pangururan on Samosir Island. The litter is just poured at the roadside and get's partially burned. Other parts will rot away in the next rainy season. That's all of the 'concept' of waste management here. In 1998 there were massive fires on Sumatra, also affecting the surrounding of Lake Toba. Huge parts of Gunung Leuser Nationalpark were burning. It's always said that these fires were at least partially laid by people respectively companies with interests on the land. There are also some industries at the southern part of the lake as an aluminium factory and paper mills with impact on the lakes ecology. Although consumer goods are available in every shop, there is no sufficient waste disposal system in the area. Especially plastic is a problem. Since it seems anyway useless to collect rubbish in dustbins, the local people just throw it away, literally out of their windows. It looks nasty, it accumulates and, sometimes it's eaten by animals (cows, pigs, water buffalos). To develop a consciousness for environmental problems and waste reduction, the Silimalombu ecoproject teaches local children the interconnections of ecology and health. They start to keep their village clean. However, since there is only a rudimentary waste disposal service and no professional waste disposal site on the island, they themselves can not provide a complete and satisfying solution for the problem. The local authorities deal with the problem as it is often the case in 'developing' countries: they throw the rubbish into the nature, what is called 'wild waste disposal sites' in the west, and try to burn it there. Nevertheless, optically the Toba region looks still intact. It's all green and there is much forest. The Indonesian populations are growing still rapidly, and the Batak People are no exception. Marriages over marriages over marriages happen, babies over babies over babies are born, and the many young people need room to live in. Every year many new houses are built around the lake region, changing the landscapes more and more. However, many young and ambitious people leave the region on the search for a job. They go to Medan or other places, or they leave even for Jakarta. Together with growing settlements, more people and an ever 'must grow' capitalist economy it's predictable that the lake will be more and more 'developed'. If there is anyhow money 'to make' here, it will be made.